Below is the syntax of the split method. Write the below code for the split function. 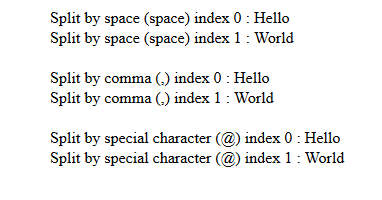 Here are some examples to split the string by space, comma, special character. In the above example, we tried to split a string object by space, comma (,), special character (@) and accessed the split string using its index like "Hello, World". Here, we did split this string by comma and after splitting, we accessed this by its index like 0 or 1 and so on. Split string index depends on the length of the split string.